This entry was posted in Ad Supported, Freemium, Paid Content, Streaming, Subscriptions and tagged CD sales, IFPI, Music Revenue, Napster, Rdio, Rhapsody, Spotify, Streaming, Wimp by Mark Mulligan. Bookmark the permalink. 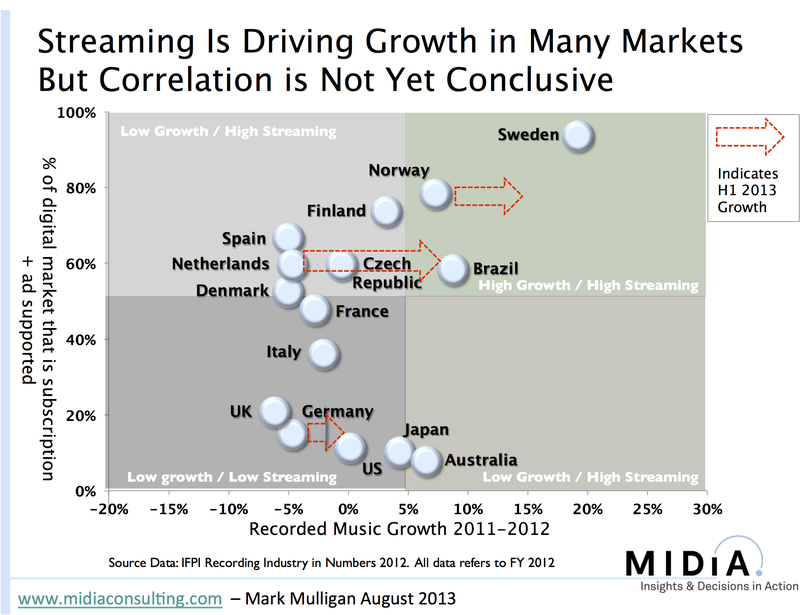 Streaming can only introduce permanent stagnation! If we will allow to continue with those portable Turbo Napsters we will shrink potential size of music market from over 100 billions USD to best case scenario 25 billion plateau in 2020. Revenue is not the most important indicator profit is. Gross margin is considerably higher on digital and you are not taming that in to consideration. Just wondering whether you might have got a typo in your graphic below? Shouldn’t the bottom right tile say High Growth / Low Streaming?